Laboratory pretreatments may not be possible for forams that are less than 8 mg depending on the individual size of the pieces. Note – Fees are inclusive of d13C measurements, quality assurance reports, calendar calibration when applicable, and 24/7 web access to past results and pending analyses. For some tiny samples, it may not be possible to measure and report a separate d13C result. However, the total corrected fractionation will be accounted for in the final result. 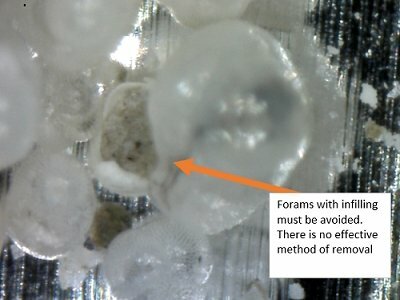 Pretreatment – Foraminifera samples that are less than 10 mg may be too small for chemical etching depending on the size of the individual pieces. Generally, samples under 8 mg in weight on arrival will be microscopically examined and a picture taken but not chemically etched with acid or sonicated. A communication will be sent for samples like this. If you have any concerns regarding the pretreatment of your sample, please contact us to discuss this further. Reservoir Correction – Please provide the appropriate Delta+R / Delta–R (localized reservoir correction) for the area of collection so that we can supply the most appropriate calendar calibration for the result. A Delta±R correction is applied to the sample that has already been corrected with the global marine reservoir correction. The value that is provided by the client is subtracted or added to this already corrected age (depending if it is a Delta+R or Delta–R value). Note: A negative Delta-R will make the date older (typically presuming freshwater dilution from the global marine average). 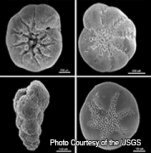 Sample Size for Foraminifera – The lab recommends sending more than 8 mg of clean forams for carbon dating to allow pretreatments that have proven to be effective in improving accuracy in some cases as well as d13C and d18O measurements. Pretreatment is not possible for 4-8 mg of forams but d13C and d18O measurements can be performed. Pretreatment and d13C and d18O measurements are not possible for 2-4 mg of forams. Communications are sent on all samples that cannot be pretreated. While we recommend sending at least 10 mg for ostracods, we realize that this is not always possible to obtain. At a minimum, we can accept 5 mg although there are limitations to pretreatment and d13C measurement. You may send the ostracod samples in counting slides, but make sure that the glass cover pane is taped and cannot move during shipment. Alternatively, you can put the ostracods into a small screw top glass vial or a plastic microcentrifuge tube. The top should be secured. Place the slides, tubes, or vials into a Ziplock bag. Make sure that the bags are well padded with bubble wrap or some other material to protect them during shipment. Found in all marine environments, foraminifera are single-celled organisms with no tissues or organs. They are small in size, ranging from several millimeters to a few tens of microns. Forams can be planktic or benthic. Planktic forams live in the upper zone of the ocean, while benthic forams are found on or beneath the ocean floor. Forams are often used in biostratigraphic studies and palaeoenvironmental reconstructions. Benthic forams make excellent indicators of ocean depth that is why they are often utilized in palaeoceanographical research. Planktic forams are found in the open ocean and are often used as indicator of ocean currents and climates. Researchers also use forams to study marine pollution. Ostracods (Ostracoda) are small crustaceans that are found in both freshwater and marine habitats. According to the British Geological Survey, ostracods are between 0.5 and 1.5 mm long, but a few (e.g. Gigantocypris) grow to about 25 mm. Unlike most crustaceans, ostracods are not segmented, and their heads and bodies are merged. Scientists use ostracods in multi-proxy paleolimnological investigations.